Kids on the Radio is a new and exciting youth program featuring our Children: The Future Leaders of America. 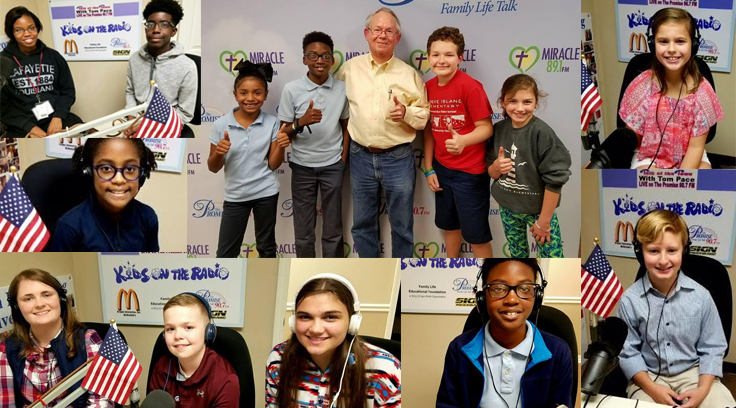 Every Tuesday and Thursday from 5-6pm, two to four students (ages 8-18) from Bossier Parish and Caddo Parish Schools join Tom Pace LIVE in McDonald's Studio 3A during Talk of the Town on The Promise 90.7 FM to talk about the accomplishments in their lives, from school, church, sports and family, to sharing their achievements and the fun in life. Sponsor a child, then listen to them on The Promise 90.7 FM, as we give a voice to our future. All donations are tax-deductible. With help from you, children at risk and children overall, will learn a skill and art form of media production and networks. What greater gift can we give than that of lifted spirits. Help us teach and mentor the youth of Northwest Louisiana. This concept is the brainchild of Dottie Bell of the Caddo Parish School Board. Below you will find links to forms that will help you support this great cause. The Promise 90.7 Fm is a division of Family Life Educational Foundation, a 501(c)3 Non-Profit Organization.